Shirley Mae Grill Bishop Goldman, 87, passed away Tuesday, Sept. 4, 2018. She was born July 2, 1928, in Dunbridge. She was raised by F.W. and Nell Grill in Tiffin. In 1952, she married Ted Bishop and together they had four children. Later the marriage was dissolved. In 1981, she married Robert Goldman. Along with her husband of 37 years, Bob, she is survived by her four children, Jane (Dave) Shively, Martha (Ed Newman) Bishop, Barb (Fuzzy) David and John (Cathy) Bishop; two stepdaughters, Christine George and Lisa (Dennis) Doyle; six grandchildren, Carrie Hancock, Kris Hiser, Jeff Hiser, Danielle Bishop Rueda-Fabila, Alexandra Bishop and Devin Doyle; three great-grandchildren, Kyler, Regann and Brennan Hiser; and many nieces and nephews. She was preceded in death by her parents; a sister, Helen Grill; a brother, James Abrams; a sister, Helen Nuzum; a daughter-in-law, Barbara S. Bishop; and a grandson Ben Shively. 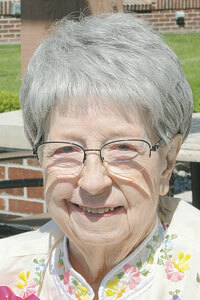 She graduated from Tiffin Columbian High School and Heidelberg College with a degree in education. She taught first grade for two years in Sandusky City Schools and taught kindergarten for 17 years in Elmwood Local Schools, Wood County. Shirley loved the outdoors and cherished her memories of childhood summers spent at Lake Mohawk, camping and picnicking at East Harbor State Park and sharing that love with her children and with girls as a Girl Scout leader. She and Bob shared a love of history, language and travel. Her favorite place to visit was England and they traveled there several times. Shirley was a past member of the writers group and the readers group of AAUW, University Women, Wood County Retired Teachers, Woman’s Club and Wood County Historical Society, where she and Bob volunteered. Visitation will be 3-6 p.m. Saturday, Sept. 8, 2018, at Dunn Funeral Home, 408 W. Wooster St., Bowling Green, OH 43402, located in the historical district of Bowling Green. Additional visitation will be noon until the time of her service Sunday, Sept. 9, 2018. A celebration of life service will begin at 12:30 p.m. Sunday at the funeral home. Interment will take place at a later date. Memorial contributions may be given to The Wood County Historical Society or Elmwood Elementary School Library. To share an online condolence or fond memory with the Goldman family, please visit www.dunnfuneralhome.com.